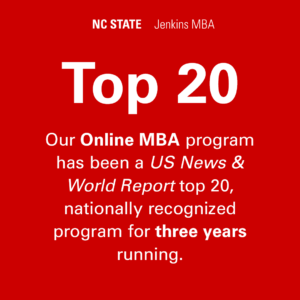 U.S. News & World Report ranked NC State University Poole College of Management’s Jenkins Professional Online MBA program No. 18 nationwide in its 2017 Best Online MBA Programs ranking released today, among the top 7 percent of ranked programs. This marks the third consecutive year US News ranked NC State’s online MBA among the top-20 programs nationwide. 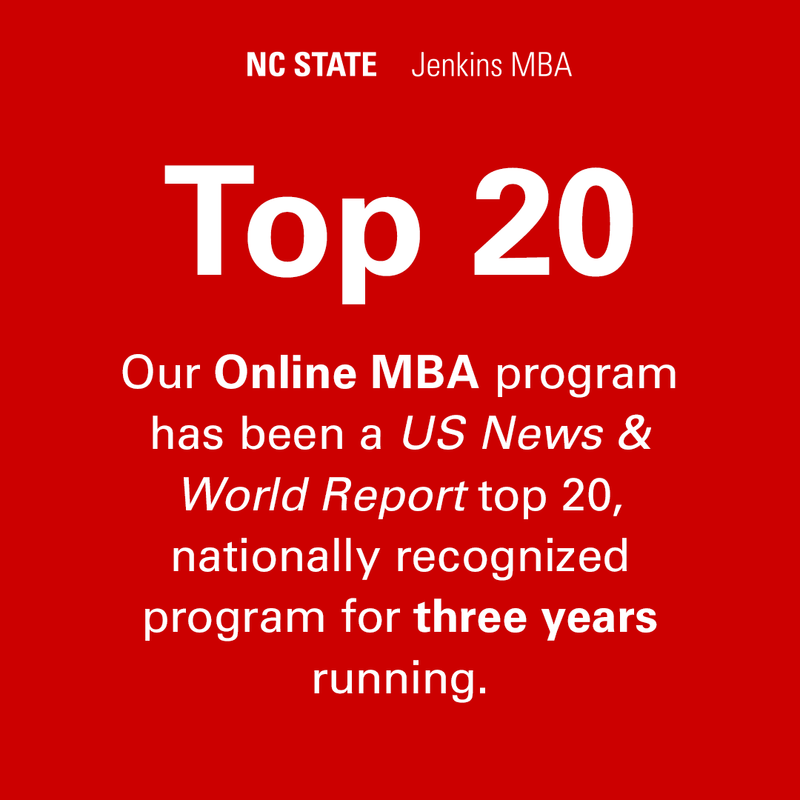 This is the second top ranking for the Jenkins Professional Online MBA in recent months and reinforces the quality and growing reputation of the NC State offering. The Princeton Review ranked NC State No. 9 in its September 2016 Top Online MBA Programs list. “I am so pleased with the recognition for our Jenkins MBA program – it is a reflection of the quality of our program, scholarship, faculty and students. There is no question that our reputation as a top college of management is stronger today than ever before,” said Annette L. Ranft, dean and Stephen P. Zelnak Jr. chair of NC State’s Poole College of Management. “NC State’s unique approach enabling working professionals to seamlessly combine online and face-to-face courses, and move through the program at their own pace – not to mention our incredible value – really differentiates us,” said Steve Allen, associate dean for graduate programs and research, NC State Poole College of Management. The US News Best Online MBA Programs ranking methodology remains unchanged from 2016 and is based on a combination of student engagement (28 percent), admissions selectivity (25 percent), peer reputation (25 percent), faculty credentials and training (11 percent) and student services and technology (11 percent). Between the start of US News’ data collection in August 2016 and the October 2016 closing date, 255 schools indicated they would be offering online MBA programs, up from 228 the previous year. Programs with overall scores are in the bottom 25 percent are categorized as Rank Not Published. Sixteen schools are designated as unranked because they reported having fewer than ten students enrolled or because their programs were less than a year old at the time of the data collection. This marks US News & World Report’s sixth annual ranking of online graduate management programs. The full ranking may be viewed at http://www.usnews.com/education/online-education/mba/rankings. The next application deadline for the Jenkins Professional Evening and Online MBA programs is February 2, 2017. Learn more.